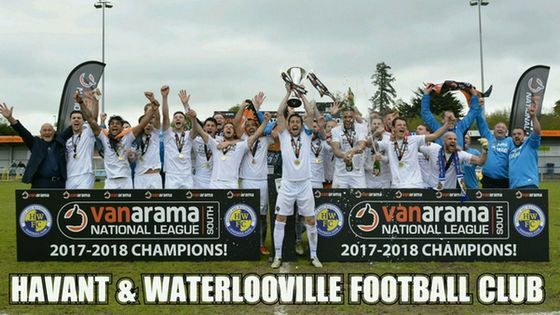 Havant and Waterlooville will join the likes of Chesterfield, Hartlepool United, Leyton Orient and Wrexham in The National League next season after Jason Prior’s 89th minute goal sealed promotion for the Hawks against Concord Rangers. The Hawks went into the break leading 2-0 courtesy of efforts from Theo Lewis and Matt Tubbs, with the latter scoring from an unusual source. But Concord came out fighting and determined in the second period and with around 10 minutes left in the game it was level at 2-2. But up stepped Jason Prior in the 89th minute with the ball fed to him in the penalty area, one on one with the kepper he calmy slots the ball home and Westleigh Park went into fever pitch. At Full-time the traditional pitch invasion took place with players and fans alike celebrating the league title together before the presentation which saw Brian Stock lift the coverted National League South trophy! The Westleigh would then be buzzing afterwards for the End of Season awards and party with the players, such as Mike Carter and Ryan Woodford, acting as DJ’s for the night showing quality away from the field of play.